OTTAWA -- Canada should invoke the new Magnitsky Act to sanction those responsible for the killing of Washington Post journalist Jamal Khashoggi, the official Opposition said Monday. 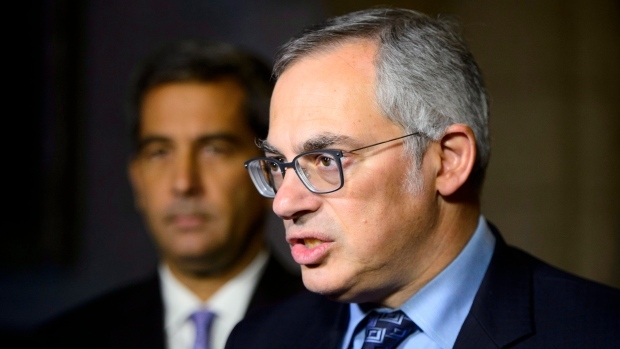 Conservative justice critic Tony Clement says that Saudi Arabia has already identified some individuals who were partially responsible for Khashoggi's death, adding that the Magnitsky law is a next step the government should consider. "This may be a prime case for applying the Magnitsky law," said Clement. Last year, Canada passed the Justice for Victims of Corrupt Foreign Officials Act, known as the Magnitsky Act, which gives the government the authority to freeze Canadian assets of foreign individuals who are found to have violated human rights. Clement's comments follow the same urging by NDP foreign affairs critic Helene Laverdiere, as well as a similar bipartisan demand in the U.S. Congress. Laverdiere said the NDP hopes there will be a United Nations investigation into Khashoggi's death. "When those responsible are identified, will the government be prepared to enforce the Magnitsky law?" Laverdiere said in question period last week. Foreign Affairs Minister Chrystia Freeland and Prime Minister Justin Trudeau condemned the murder of Khashoggi on Monday, saying the various Saudi explanations for his death lacked credibility and consistency. The government has not yet offered a concrete response on whether it will consider using the Magnitsky law in this case, saying it's consulting Canada's allies on this issue. Canada's version of the Magnitsky law is based on the Global Magnitsky Act, a bill passed in 2016 that allows the U.S. to sanction foreign human rights violators. Two weeks ago, long before Saudi Arabia acknowledged its role in Khashoggi's death, a bipartisan group of Democratic and Republican senators from the Committee on Foreign Relations wrote to President Donald Trump calling for sanctions under the act, automatically triggering a requirement that the president launch an investigation and decide within 120 days whether to take action. "The recent disappearance of Saudi journalist and Washington Post columnist Jamal Khashoggi suggests that he could be a victim of a gross violation of internationally recognized human rights," reads the letter, signed by a number of prominent Republican and Democratic U.S. lawmakers, including Tennessee Republican Sen. Bob Corker and South Carolina Republican Sen. Lindsay Graham, a close congressional ally of the president. "We request that you make a determination on the imposition of sanctions pursuant to the Global Magnitsky Human Rights Accountability Act with respect to any foreign person responsible for such a violation related to Mr. Khashoggi." Named for whistleblower Sergei Magnitsky, who was beaten and denied medical care before his death in Russian custody in 2009, the 2016 law expanded on an earlier version designed exclusively to target Russian officials. Freeland said she has spoken with her counterparts from Germany and Turkey in recent days, and is actively engaged with Canada's allies in a crafting a joint response. "We are working together to press for a transparent and credible investigation and we are very clear that there must be an accounting for this murder; those responsible must be brought to justice and must face the consequences," Freeland told reporters Monday in Ottawa. Clement acknowledged Freeland's position, which also came in a written statement on Saturday, and said the government needs to do its "diligence on this." "If you want a next step that has been sanctioned by Parliament, our Parliament, the Magnitsky law...could be something that should be looked at," said Clement. During a press conference with a visiting Mexican delegation, Freeland declined to answer questions about whether the government is considering scrapping the lucrative $15-billion contract to provide Ontario-made light armoured vehicles Saudi Arabia. "We have frozen export permits before when we had concerns about their potential misuse, and we will not hesitate to do so again," Trudeau said later in the House of Commons. Trudeau also convened a meeting of the government's new the Incident Response Group, which includes cabinet ministers and senior government officials, to discuss the Khashoggi affair. Khashoggi disappeared on Oct. 2 after entering the Saudi consulate in Istanbul to get paperwork he needed to marry his Turkish fiancee. Turkish officials say he was tortured, killed and dismembered at the diplomatic outpost. "Canada is very mindful of the fact that this murder occurred in Turkey and it's very important for Turkey to be a part of the conversation," said Freeland.